Nicole Millers womenswear brand started from a single shop on Madison Avenue in 1986, Kenneth Cole started out mainly as a company which sold high-end shoes, and Lucas Luggage started out as an unknown American brand selling lightweight luggage and traveling gear. 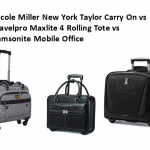 Today, these three companies represent some of the finest known luggage world-wide, and although they operate differently and offer luggage products to different audiences around the globe, their high-end under seat options greatly compete with one another. But which brand is better? Particularly, for this review, we have compared the top favorite under-seat carry-on products in each brand. Nicole Miller’s Under-Seat suitcase from the brand-popular Paige collection, Kenneth Cole’s Reaction Carry-On known for its rogue butch femininity design, and Lucas’ 15-inch Under-Seat which levels the playing field between two better known brands by bringing expandable packing space to the competition. In researching these brands and their under-seat products, we decided to organize our findings into four comprehensive subject categories: suitcase storage, materials/durability, additional features, and size/style options. By comparing these suitcases side by side with nothing but the facts (and nothing held back), we hope that you – our readers – will easily be able to compare the brands for yourself and truly pick out a travel favorite while also seeing which of these brands reigns supreme. The point of an under-seat bag is optimal comfort and simplicity – for instance, if you’re the last one onboard an airplane, the under-seat option removes the fear of full overhead bins; merely tuck this Nicole Miller under-seat bag right under your chair. And, at its 15-inch size, laid flat this won’t be a hard fit. 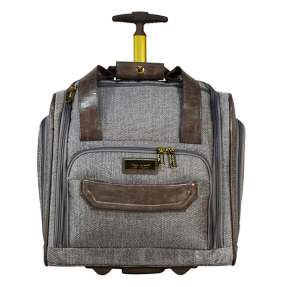 Other perks to this Miller original are its lightweight construction, and ability to roll along beside you for easy hassle-free travel, or carry as a tote at your side when airports are crowded or you’re in a hurry. Crafty storage design is a necessity when it comes down to under-seat bags; Nicole Miller beats out all the competition with their storage design that includes not only two front pockets (one velcro, the other zippered and deep), but also two zippered side pockets that are deep enough to fit extra shirts, a sweater, or even a pair of thick jeans. The main storage space is both wide and long enough for a laptop computer, and offers stacking room for several outfits (up to two days of clothing if you’re not a picky packer). Nicole Miller’s underseat bag is made from a polyester and cotton canvas blend for a designer printed look that screams sophistication without sacrificing necessary durability; however, for packing a laptop and other electronics customers suggest packing clothes first for added padding that the interior lacks. The wheels are made from durable polyurethane and are ultra-strong because they’re skate wheels rather than spinners; additionally, the telescopic handle is made from machined aircraft-grade aluminum for added structure and protection while you’re mobile. 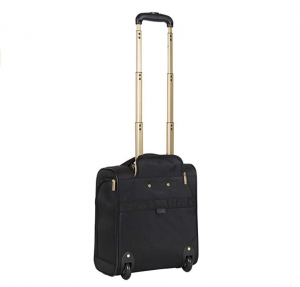 Suitcase includes top easy tote carry handles, a multi-stage retractable handle which locks in place at three different stages, side and front zippered pockets, and self-repairing zippers. 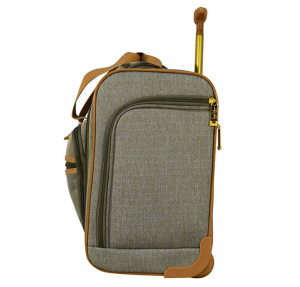 At 15.5 inches this carry-on bag fits under most national and international airline seats (though it’s also a great fit for confined overhead spaces). Styling options include 11 different signature looks for your one-of-a-kind fashionable look; if you’re going for a more spirited style we suggest going with Woven Teal, but easily the most business-chic look is Silver. 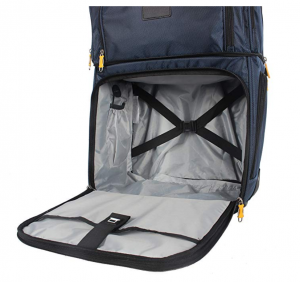 The exterior storage features four pockets, one side stretch pocket (rather loose, so careful what you pack there – many travelers call this an ‘umbrella pocket), one side zippered pocket, and two front-facing pockets. 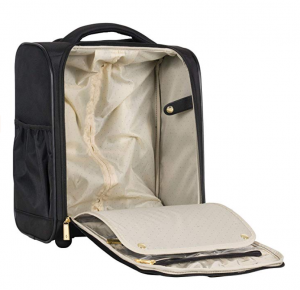 Interior storage includes two zippered pockets that are part of the opening face and are great for toiletries/etcetera. The main interior is large enough for two or three stacked outfits (depending on how/what you pack). 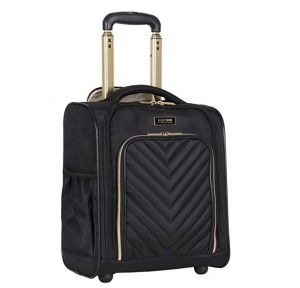 In this particular Kenneth Cole Carry-On design, you’re looking at polyester with a chevron-quilted front for added durability from front abrasions. This means if you pack a laptop, pad clothing on the back of the suitcase, and keep your laptop near the front; this technique will especially protect your electronics when tucked under a tight airplane seat. 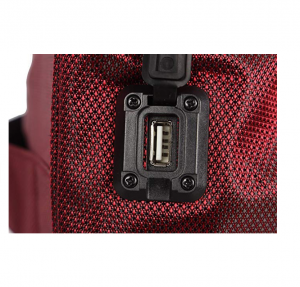 The main zip down compartment consists of a garment panel with two wet zipper pockets. 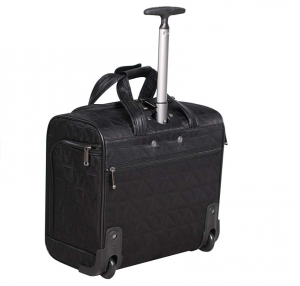 Rear exterior includes a trolley strap to fit over most luggage upright handles, for hands free carrying. Dual side exterior zippered beverage/ accessory holster pockets. Padded, easy-to-grab top handle. 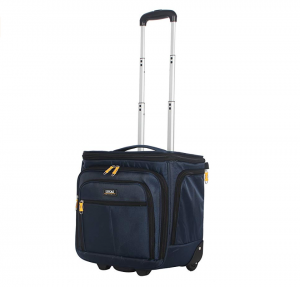 Sturdy front bottom feet keep bag upright and in-line skate wheels provide swift mobility. Purchase also includes a 10-year limited warranty! 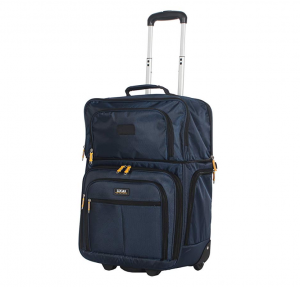 With an impressive unpacked weight of 5.65 pounds, this carry-on measures in at 15 x 13.5 x 7.5 inches and is the ideal size for most national and international under-seat storage. However, when it comes to the style department, Kenneth Cole only offers two options – black and navy blue – and so these suitcases aren’t really customizable to your personal fashion sense. In the style department Lucas Luggage’s carry-on isn’t winning many points – it looks a little like a wheeled lunchbox – however, not only does its shape give you more packing space than any other under-seat carry-on, this suitcase is also expandable with a pull-out box roof; in our book that’s a point in this brands favor. If storage is king, this suitcase gets the crown. Its box shape gives you more interior room for stacked outfits or even a pair of shoes and then up to two outfits. 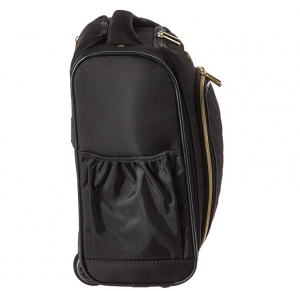 Additionally, more storage comes in the form of two zippered side pockets and three front pockets. Once expanded, this suitcase even gets a third front top pocket that’s part of the pull-out top; expansion offers up to 50% more packing space for up to 3 days of packed clothing and extras. We love this design. Made from lightweight dobby polyester, this is one of the lightest bags, but not one of the most durable. For packing a laptop, for instance, you’ll want to pad your electronic in between clothing for minimum protection at best. However, this suitcase is quite scratch resistant and very water proof. 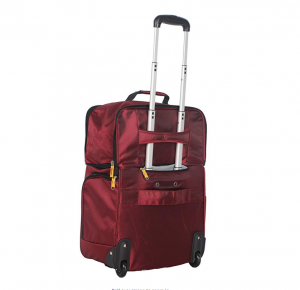 The handle is made from durable aircraft-grade aluminum, and the wheels are made from durable polyurethane. 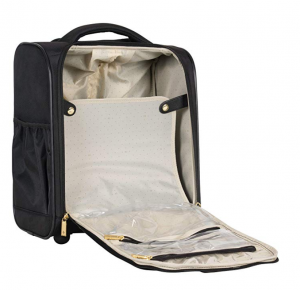 This Lucas original boasts a spacious main compartment with a zippered fold-down entry for clear access to all its contents. It also uses a dual-pole telescopic handle system as opposed to the traditional single pole handles to provide extra durability and stability. The suitcase convers from an underseat carry-on and expands to become a full-size carry-on meeting the standards of most airlines. 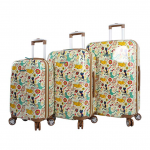 Sizes vary for this unique expansion design; not expanded this suitcase measures in at 15 X 8 X 13.5 inches for ideal underseat storage while you’re traveling; once expanded, however, the suitcase measures in at 15 X 8 X 22 inches and is only suitable for being but in your overhead airline bin. 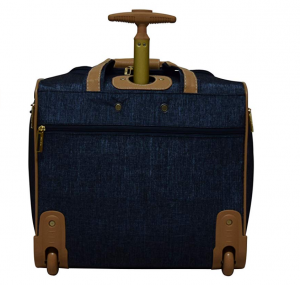 Once again, style options don’t quite match the value of the Nicole Miller carry-on option, and this Lucas bag is only available in blue and red. 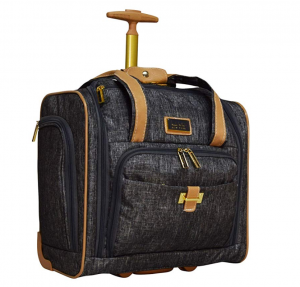 The suitcases in this review are pretty neck and neck when it comes down to materials and their unique fit under your seat; however, when it comes down to style and storage capacity the results vary and your personal needs will be the deciding vote on which brand wins. Nicole Miller easily offers the best style options for your travels with over 11 different unique options. 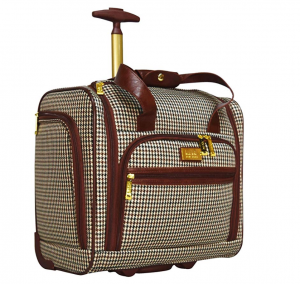 Lucas Luggage, on the other hand, offers the most packing space with an expansion pull-out top that transforms the underseat design into a full-sized carry-on (although this does mean you’ll have to store the suitcase in an overhead bin). In the end, it depends on what you’re going for, especially if you want more of that masculine metrosexual style that the Kenneth Cole Carry-On brings into the mix.